We joined a small local wine shop. The main reason for this was variety. 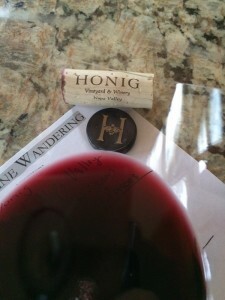 I think it’s important that you continue to try wines and styles from winemakers. Winemakers are like chefs, they have their own recipes. They can use the same varietal and produce a totally different wine. 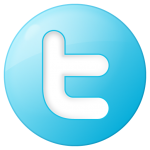 This is one of the things that fascinates me. Aromatic, young-fruity with aromas of blueberry, cherry, spice, cassis, oak and a little jammy. I think the jammy notes comes from the higher alcohol. Dry, full-bodied with great acidity. The tannins are medium and slightly astringent. Decant this one if you want to soften it. The Cabernet Sauvignon was rich with a great tannin structure. Nice mid-palate. How much: $45.00 per bottle. Varietal composition: 87% Cabernet Sauvignon, 9% Petit Verdot, 3% Cabernet Franc, 1% Merlot. Barreled 18 months in 100% new American Oak. 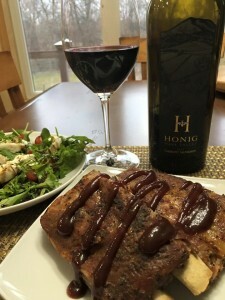 The Honig wine paired well with our ribs. 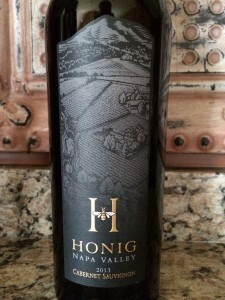 I rated the 2013 Honig Vineyard and Winery Cabernet Sauvignon four glasses. We need to visit the winery soon.